Those who make their home in Fulton County can experience it all: safe, rural communities that are just a short drive away from a bustling metropolitan area. Nature lovers can enjoy outdoor recreation including hiking, fishing and hunting. If golf is your game, take a swing at one of several beautiful courses. Visit Sauder Village, a living history destination that transports guests back to the 19th century. Head to Wauseon, home to cruise-ins and the Fulton County Fair, one of the largest fairs in the state. Tantalize your taste buds with a trip to one of Fulton County’s gourmet chocolatiers, or sip a locally-crafted wine. Numerous farmers markets offer a chance to enjoy the area’s agricultural bounty spring through fall. Fulton County features convenient routes to Toledo, Detroit, Cleveland, and Chicago. 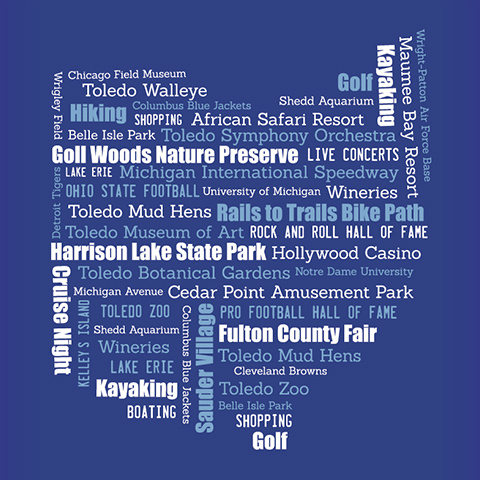 Professional sporting events, world-class museums and countless cultural events are just a short drive away, as is beautiful Lake Erie. It’s all here—excellent school districts, bustling industry and a high quality of life—right in Fulton County.